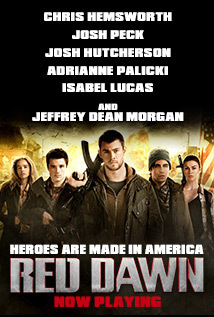 Red Dawn (2012) – What's New on Netflix Canada Today! The city of Spokane, Washington is awakened by a North Korean paratrooper invasion. Marine Corps veteran Jed Eckert and his civilian brother, Matt, escape with a group of friends to an isolated cabin in the woods, where they witness the execution of their father at the hands of the ruthless Captain Cho. The brothers unite with their friends to form a guerrilla resistance group–the Wolverines–to drive the invaders from their home.